Here’s another smaller portion recipe in my “Mini Series” Mini Recipes for the 3 Quart electric Pressure Cooker. These Instant Pot Mini Cornbread Squares are made from scratch, and have a nice cornbread flavor and texture. 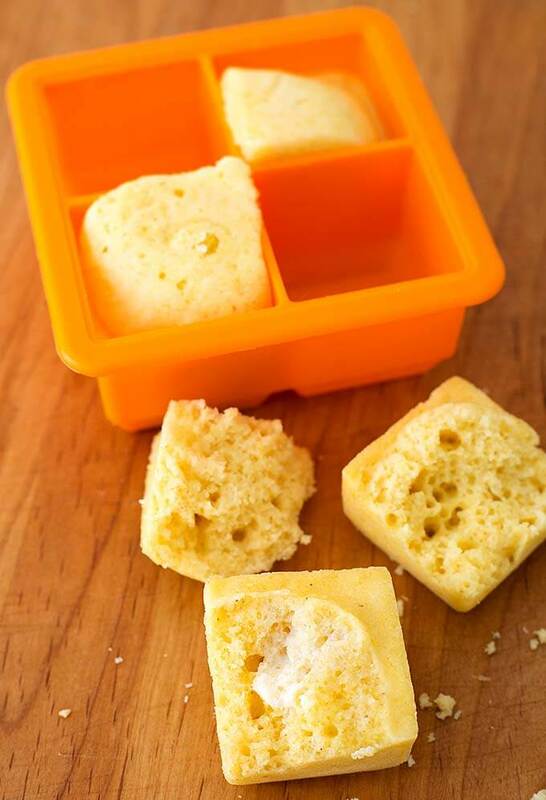 My pressure cooker mini cornbread squares are easy to make! When I make chili I usually make cornbread to go with it. 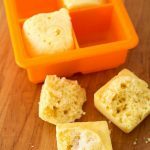 In the summer when I don’t want to turn on the oven, I make Instant Pot Mini Cornbread Squares. The recipe makes four 2″x2″ squares of cornbread, and it’s from scratch! It’s easy! Along with all of my other favorite Instant Pot accessories, I use silicone in my Instant Pots to cook with. A while back I found these ice cube trays made out of silicone, that are safe for cooking in. They have 2″ square openings. 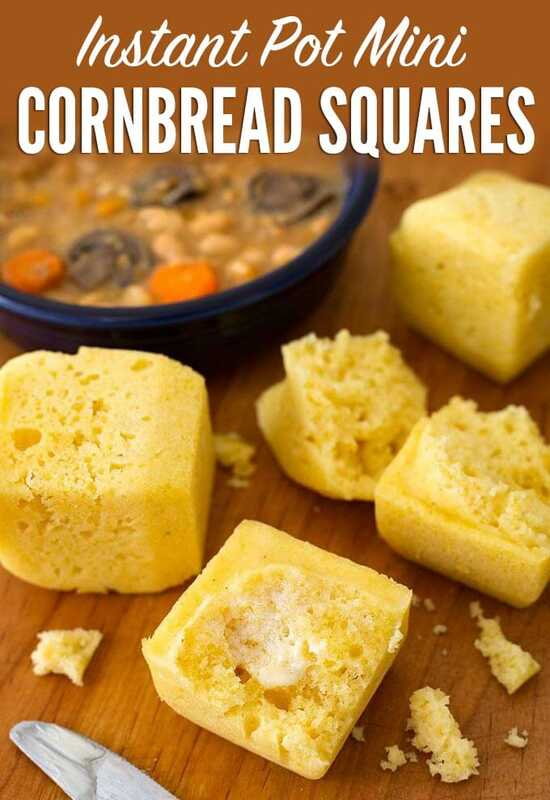 Perfect for Instant Pot Mini Cornbread Squares (See my Amazon picks at the end of this post)! 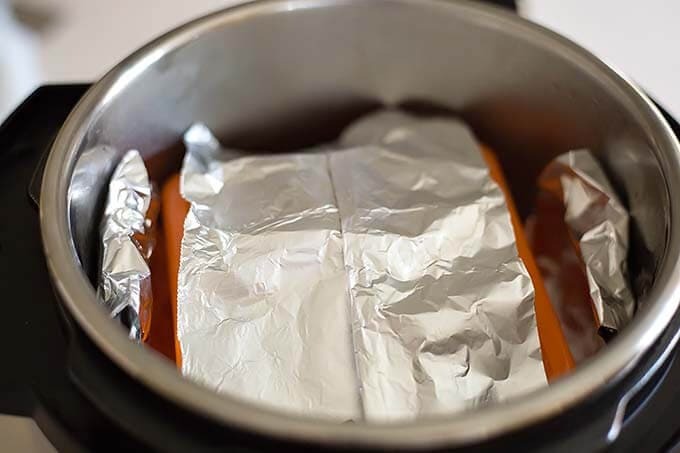 A foil sling is a simple tool you can make to help get the pan in and out of the pressure cooker. Just fold a 21″ length of foil 3 or 4 times along the long end of the piece. A trivet with long handles also works. Be sure to cover the pan with foil so water doesn’t get in. Since it is usually just Paul and me, I like making smaller portions of things I don’t like to eat as leftovers. Cornbread is one of those foods that I don’t like to have leftover. I much prefer fresh! 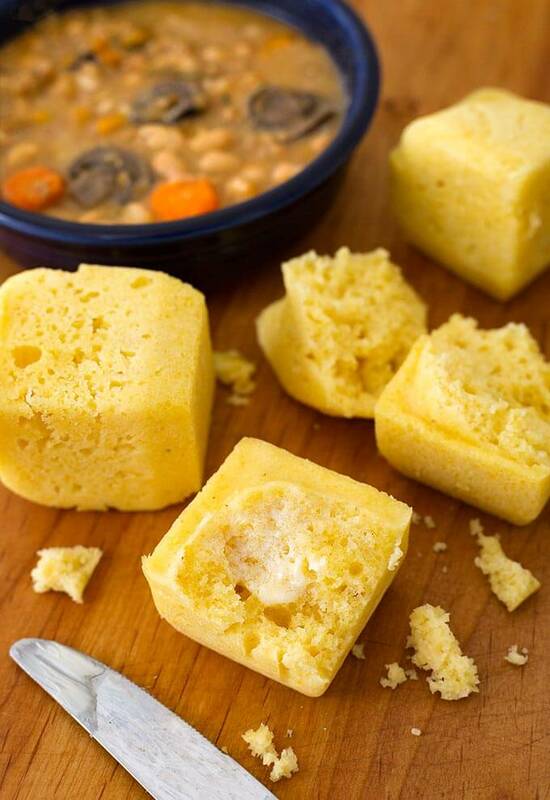 Instant Pot Mini Cornbread Squares go well with Sweet Potato Chili, Tortellini Soup, and as a snack! Instant Pot Mini Cornbread Squares are made from scratch, and have a nice cornbread flavor and texture. This recipe yields four 2-inch square cornbread muffins! Put 1 cup of water in the inner liner of the pressure cooker. 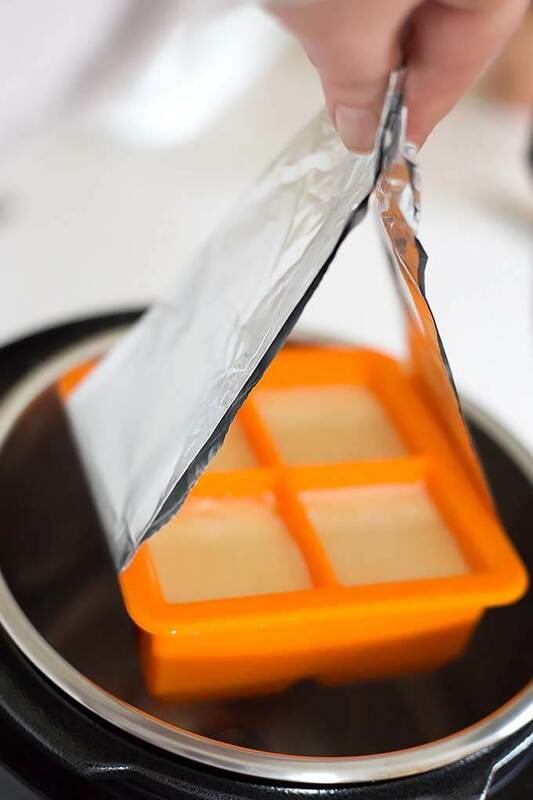 Spray a small (food/oven safe) silicone ice cube tray with four 2" square openings (or another baking container of similar configuration) with cooking spray. Set aside. Sift dry ingredients together into a small mixing bowl. Add the egg to a cup and use a fork to beat it. Add the milk and melted butter to the egg and whisk well to combine. Add the wet mixture to the dry and gently combine until the dry ingredients are just moistened (don't over mix, a few dry spots is fine). Fill the silicone tray with batter in the four openings equally. If your trivet/rack doesn't have handles, make a foil sling. 20" length of foil, folded lengthwise 3 times. Use sling to get the tray into the pressure cooker, setting it on the trivet/rack and folding the ends of the sling over the tray. Press Pressure Cook (Manual) and then the + or - button or dial to choose 13 minutes. When the cooking cycle ends, let the pot sit for 15 minutes (natural release). Then turn the steam release knob to the Venting position to release the remaining pressure/steam (there may not be any, and that's okay). When the pin in the lid drops, open the lid and carefully grab the ends of the sling to lift the tray out of the pot and onto a cooling rack. Let sit for 5 minutes. Remove the foil covering, turn the tray upside down, and gently press on the bottom of the squares and the muffins will fall out. Slather with butter, honey, maple syrup, or whatever you like with your cornbread! These are wonderful with black beans, chili, and as a snack! Would this just be doubled for the 6 qt Instant Pot? Hi Sherry, you can double this and make more cornbread squares if you have a container with more openings. What can I use in place of butter for low fat? Made these tonight using my eggbite mold and was very pleased with how they turned out considering how easy they were to make. Since the eggbite mold makes them a bit smaller (I had six instead of four) I will try cooking them for a bit less time next time around to see if the texture is a bit softer. Great idea! Thank you for your review! I loved the ease, your specific instructions, the texture and the taste of the finished product. I did not put the aluminum foil on top as I tried that once before with another cornbread recipe and it turned out tough and greasy. I just removed the lid straight up and got no spills. Only one thing — a newbie mistake — I poured the cup of water right into the Instant Pot (no bowl). So it’s now in the three day dry-out period. Since the mix was done, I cooked it in my 6-qt for the same time at high pressure and then released the pressure after 15 mins. Still perfect!